The Sly Fox Film Reviews: Roman J. Israel, Esq. Roman J. Israel (Denzel Washington) is a high-functioning savant on the autism spectrum who has been practicing law in L.A. for the past 36 years. The brilliant attorney has spent most of his career under the radar, writing legal briefs in a rear office for indigent criminal defendants, while his partner, William Henry Jackson, served as the face of the firm, whether cultivating clients or arguing their cases in the courtroom. This unorthodox arrangement worked well for Roman who, besides his disorder, is a longtime political activist dedicated to a progressive agenda, namely, to assist downtrodden individuals unfairly ensnared in the net of the prison-industrial complex. And because of that commitment, he's been willing to work for far less pay than colleagues of his caliber. Consequently, the highly-principled lawyer has had to scrape by on a modest salary, living in the same dive for decades, where he subsisted on a steady diet of peanut butter sandwiches and jazz classics played on an old-fashioned turntable. Everything changes the day William Jackson suffers a heart attack and the two-person firm is forced to dissolve. Roman first applies for a position with a public interest non-profit that shares his values. But when the empathetic director (Carmen Ejogo) explains that she doesn't have the money to hire an attorney, he resigns himself to joining a corporate firm where he's soon teamed with a young associate (Colin Farrell) interested only in maximizing profits. This leaves Roman sitting on the horns of an ethical dilemma. Should he abandon his morals to keep a roof over his head? 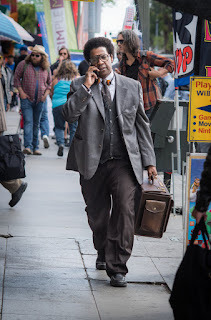 That is the question at the center of Roman J. Israel, Esq., a compelling character portrait written and directed by Oscar-nominee Dan Gilroy (for Nightcrawler). The legendary Denzel Washington is quite convincing as well as moving, here, as a beleaguered soul afflicted with Asperberger's syndrome. His powerful performance might very well be remembered at Oscar time, given the Academy's recent history of rewarding thespians playing impaired characters, including Eddie Redmayne (2014) for wheelchair-bound Stephen Hawking (ALS); Colin Firth (2010) for stuttering King George VI; Geoffrey Rush (1996) for mentally-ill David Helfgott; Tom Hanks (1994) for dimwitted Forest Gump; Tom Hanks (1993) for AIDS patient Andrew Beckett; Daniel Day-Lewis (1989) for cerebral palsy victim Christy Brown; and Dustin Hoffman (1988) for mathematics savant Rain Man. Win, lose or draw, Roman J. Israel, Esq. deserves accolades aplenty in its own right for its touching treatment of such a sensitive subject.